Die Hard is without a doubt a classic. For many, it represents to this day the template for the perfect action movie. Well, nearly perfect. Though it was never enough to ultimately tarnish the legacy of Die Hard, there has been a relatively big plot hole that has existed for nearly thirty years. Fortunately, that plot hole has finally been filled and this whole thing can be put to bed. Die Hard co-writer Steven De Souza recently attended a 30th-anniversary screening of The Running Man. During a Q&A following the screening, he finally explained away this particular plot hole. The issue in question related to the scene where Hans Gruber (Alan Rickman) pretends to be a hostage when he meets John McClane (Bruce Willis). McClane clearly suspects something but it is never specified what exactly tips him off, and there doesn't seem to be anything that would. According to Esquire, here is how Steven De Souza explains this plot hole, which has to do with some deleted scenes. "Originally, they get off the truck, the camera craned up, you saw them in a circle and Alan Rickman says, 'Synchronize your watches.' They all put their arms out in a circle with the camera moving down and they all had the same Tag Heuer watch. If you notice, the first guy Bruce kills almost by accident going down the steps, he searches the body, looks at the IDs. He steals the cigarettes, which is a laugh. He looks at the watch, which gets another laugh because you're thinking he might steal the watch. As he kills each guy, he notices they all had the same watch. When he talks to Dwayne Robinson, he says, 'I think these guys are professionals. Their IDs are too good. There's no labels on their clothes and they all have the same watch.'" So there was actually a very solid bit of intention in that moment. When John McClane sees the watch on Hans Gruber's wrist, it sets off his detective radar. Something that was supposed to be built up for the entire movie. However, it was revealed by Steven De Souza that this watch bit was taken out because it would have actually resulted in a bigger Die Hard script plot hole. The terrorists were going to escape in an ambulance, which McClane's limo driver Argyle (De'voreaux White) ultimately takes care of in the parking garage. The problem is that the ambulance wasn't around when the terrorists originally got off the truck. "[Director] John [McTiernan] says to the editor, 'Get the scissors in there. Cut as soon as you can when they get off the truck so we don't see there's no ambulance.' Now without 'synchronize your watches,' all of these moments where Bruce looks at these guys' watches makes no sense. When Bruce offers the cigarette to Alan Rickman, Bruce sees the watch. You see his eyes look at the watch. That's how he knows that he is one of the terrorists." So basically, the plot hole that has been around for 29 years only exists because it would have resulted in a bigger plot hole had they left the watch bit in. That doesn't make the relatively small Die Hard plot hole not exist, but it does at least explain it and the explanation makes it very clear that it wasn't just some lame oversight. So the good news is, Die Hard is even closer to the most perfect action movie ever made than it was before. Well done, Mr. De Souza. Now, perhaps they'll be able to do something as classic with the proposed Die Hard prequel we've been hearing about. 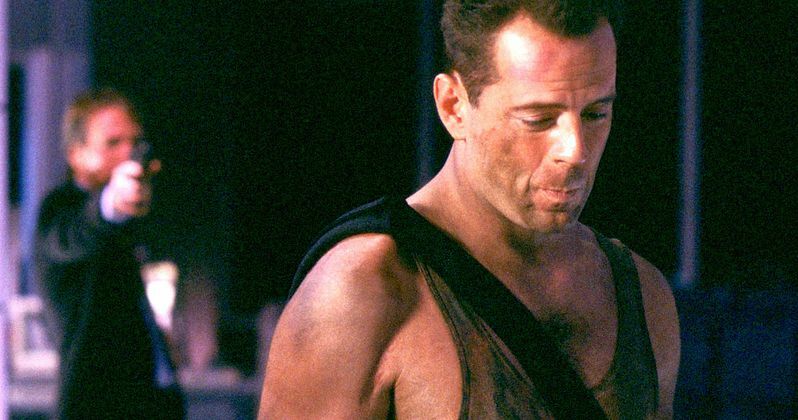 As previously reported, Die Hard 6 will be Bruce Willis' last turn in this franchise.